The current downward trend in the South African economy appears to be taking its toll on both landlords and tenants, as affordability slows rentalincome in some provinces while limited stock in others drives up rental prices to almost double the in$ation rate. These findings are included in the latest PayProp Rental Index, an industry research tool provided by PayProp, South Africa’s largest processor of rental transactions. The index tracks a series of indicators collated from real-time transaction data to provide a comprehensive view of the state of the residential rental market in South Africa. The Q1 index reveals, for example, that the highest rental price increases in Q1 2012 are to be found in the three Northern provinces, all currently undergoing major civil construction projects – such as the Gauteng Freeway Improvement Project, Eskom power stations and mining or business expansions. According to economist Mike Shüssler, who compiles our data, “along with KwaZulu-Natal, these provinces are showing above-inflation rental increases. In the rest of the country rent increases were lower than the inflation rate, with some areas actually showing a decline”. This decline can clearly be witnessed in the Free State, where a decline in the gold mining industry has made it difficult for rural towns to attract significant rental business. Welkom rentals, for instance, have barely moved since the previous index was released four months ago, remaining static at an average of R3 250 per month. 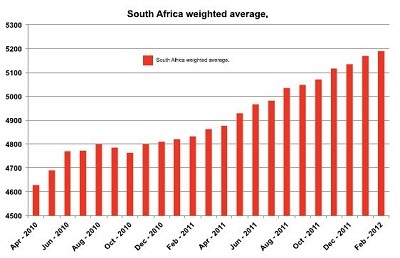 The PayProp Rental Index for February 2012 reflects a four-month moving average showing that, overall, rentals in South Africa have reached an average of R5 172 per month – an increase of 6.8% over the same period a year ago. While this is lower than the 6.9% measured in January, translating to an increase of only about R7 over the previous month, it is still higher than the overall in$ation rate. In fact, rentals are presently increasing faster than actual house prices. Average monthly rental income countrywide has now exceeded R5 000 for six months. In February, medium-sized houses reached an average price of R975 000, according to Absa "gures. Expressed as a percentage of this "gure, the annual average rental of R62 064 therefore translates to a return of 6.4% - slightly higher than bank rates of around 5.5%. Bearing in mind that landlords also pay property rates and other charges, net return on rental income is currently less than 5%. Mpumalanga still has the highest rental income in the country, at an average of over R6 100. It is followed by Limpopo, where the average is R5 892. In this region, rental increases tend to be driven by small towns such as Ellisras where demand exceeds supply, pushing up the provincial average. “The increase in some regions is not necessarily a reflection of the wealth or income of the province, but rather indicative of the shortage of supply. Limpopo, for example, has a smaller formal rental market,” Schüssler clarifies. Gauteng comes in third with rental properties earning on average R5 504 per month. The Free State again comes in at the bottom of the scale with the lowest national rental income – only R3 830 per month on average. It is interesting to note that the difference in rental income between the Free State and Mpumalanga is nearly R2 300 per month. Recent troubles in the Rustenburg area have also shown up in North West, where rent has declined by nearly 4.8%. This is likely due to work stoppages and economic uncertainty, decreasing tenants’ ability to pay their rent and damaging confidence in the rental market. Meanwhile, affordability is the main reason for a decrease in the rental average in the Eastern Cape, of around 5%. 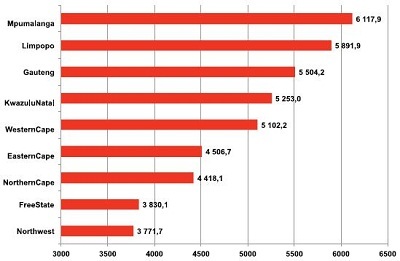 Northern Cape rentals are the second-lowest at approximately R4 420 per month. Provincial "gures mirror the market in Kimberley to a significant degree, as it is otherwise sparsely populated. Limpopo is showing the fastest rental income increase at 11.4% over the last year. This was followed by Mpumalanga, with an increase of 11%. Both these provinces show that many smaller towns and some cities are seeing shortages in formal rental stock, pushing up rental prices. Gauteng has the third-highest rental increase, with a 10.1% increase compared to rental rates just over a year ago. KwaZulu-Natal rentals are above average, showing an increase of around 8.4%. The increase in the Western Cape stands at just 4.7%, or 1% below the current inflation rate. An interesting new statistic in the PayProp Rental Index is the ratio of deposits held to rentals invoiced. 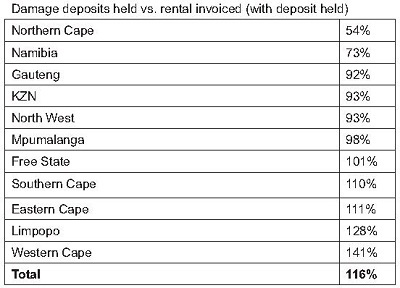 The numbers below only reflect rental amounts where deposits are also held. The results correlate largely with average provincial rentals, with Limpopo, for example, able to command higher deposits due to the current scarcity of housing stock, whilst the opposite is true for the Northern Cape, where rentals are below the country’s average. Whilst the average tenant therefore provides 1.16 times his or her monthly rental as deposit, it is clear that affordability is the driving factor behind both rental and deposit levels. The most popular rental price category (determined by the number of contracts within the price band) has been the R2 500 to R5 000 range. 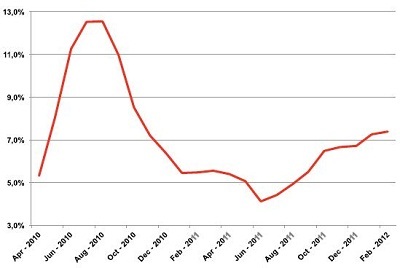 The dominance of this band has, however, diminished since August 2011, as the average national rental increased. As a result, the percentage of rental contracts in the R5 000 to R7 500 range has also grown to a similar degree. The table below outlines the contribution of all rental brackets towards the rental economy. Whilst the R2 500 to R5 000 range still contributes the most towards rental value in the country, it is interesting to note the extent to which an increase in the number of rentals in the R5 000 to R 7 500 bracket has resulted in a greater value contribution of this band. A further interesting insight is that, while the number of rentals in the R15 000 bracket has remained relatively steady, the total value of this segment’s contribution to the rental economy has declined slightly – suggesting that this price band has been less successful in attracting rental increases. During March 2012 the number of rental contracts administered by PayProp on a monthly basis was just over 47 000. The income from these properties is weighted by population and GDP weights in the various South African provinces to produce the results of the PayProp Rental Index. The overall rental increases reflected in the index are actual amounts captured on the PayProp database. The database grew by nearly 4 000 properties in the first quarter of 2012. The PayProp Rental Index is a quarterly guide on trends in the South African residential rental market, and is compiled in partnership with Mike Schüssler, one of South Africa’s leading economists. This edition details market conditions for the first quarter of 2012 based on information collected from the PayProp database. The PayProp Rental Index is available from the PayProp web site at www.payprop.com.